This car overturned in Litchfield, Maine, on Monday morning. 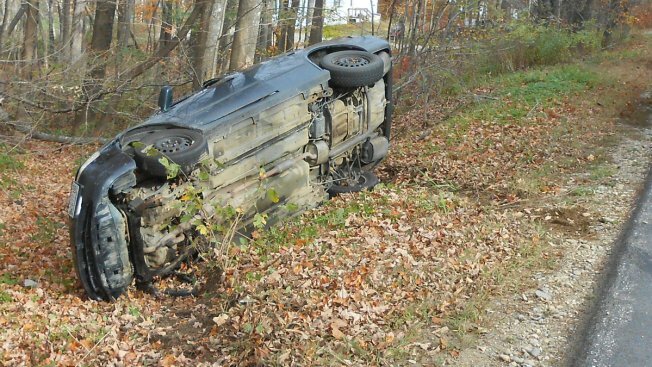 A Maine teen is facing a marijuana possession charge after her car skidded off the road and overturned on Monday morning. According to Maine State Police, Allison Dumais, 18, of Litchfield suffered minor injuries when the car she was driving skidded across Huntington Hill Road in Litchfield around 10:15 a.m. Monday, overturned on its side and struck a tree. Dumais was the only person in the vehicle, and was cited by police for marijuana possession.